Britain’s Ministry of Defense is introducing a pelvic protection system for troops in Afghanistan to help mitigate the effects of bomb blasts. The three-tiered system of clothing and body armor consists of special protective underwear and detachable armored modular trousers, designed to integrate with current kit being used by troops on operations. The Ministry of Defense said it has spent about $15.5 million on the new armor system. The first tier is being worn by troops on operations, with 45,000 pairs delivered to Afghanistan and another 15,000 ready to be issued to deploying troops. A further 60,000 are to be manufactured and delivered to troops early next year. The first layer of protection is a pair of shorts, which troops wear as underwear. Developed by the ministry and the Defense Science and Technology Laboratory, the underwear is manufactured from ballistic silk material that provides an initial level of protection. 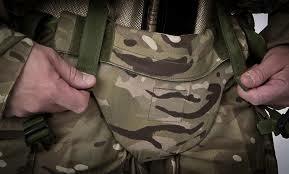 A second layer of detachable pelvic body armor, designed to meet the greater threats faced by soldiers on the ground can be rolled up and clipped to a belt and pulled through the legs to form a protective pouch. It will be issued to all troops operating outside the wire in Afghanistan from next spring. For troops whose role demands greater levels of protection, such as those operating hand-held metal detectors to search for improvised explosive devices, a third tier of pelvic protection is being developed to offer even greater coverage, including the upper leg and wider abdominal region. Design trials are planned to take place in early 2011.